The Hamilton Harriers Running / Walking Club is based out of the Downtown YMCA in Hamilton at the corner of James and Jackson Streets. We run Wednesday nights at 5:15pm and Saturday mornings at 8:00am. Come out and run with us — just show up ready to run in the main lobby. You do not have to be a YMCA member to join the Club. The Club supports the YMCA Strong Kids Campaign through funds raised on its 10 Mile Boxing Day Run. Strong Kids provides local disadvantaged children with YMCA programs including fitness, daycare, and camping. The Club meets on the second Wednesday of every second month at the Downtown YMCA to discuss upcoming events. There are occasional speakers on topics of interest to the running community. A bimonthly newsletter, “Footnotes” is mailed / e-mailed to the Club members. We have a Club Series of local races where members can accumulate points based on their placement against other Club members. We have an annual Awards Night to honour members’ performances in the Club Series and a cross country Club run in the summer with a Bar B Q to follow. There is a modest annual membership fee. The Club occasionally arranges away trips to running events. 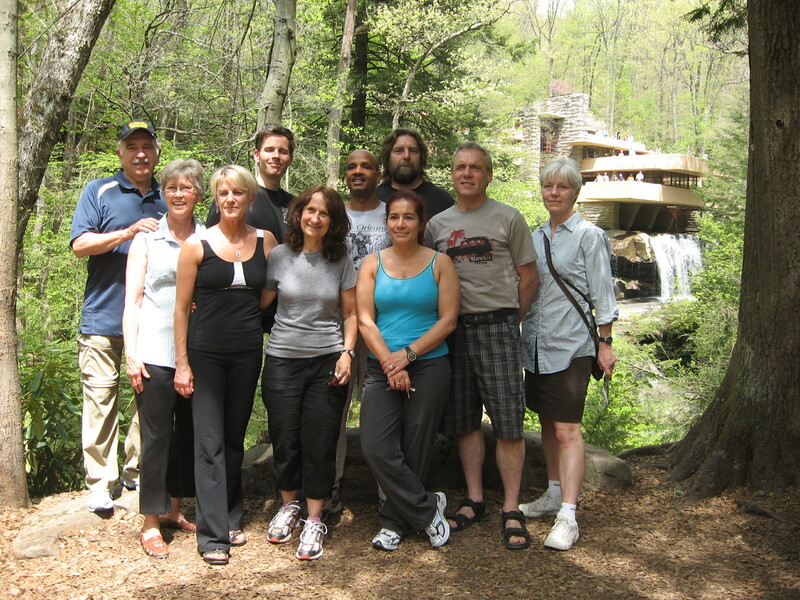 The above photo shows several Club members who journeyed to the Pittsburgh Marathon. The photo was taken in the Pennsylvania countryside in front of the residence named “Falling Water” designed by Frank Lloyd Wright. There are training sessions involving stair climbing on Thursday Night at 6:30 (starting Jan. 29th, 2015) meeting at the Chedoke Golf Course Club House, Hamilton, Ontario. For details on our annual Boxing Day Run, go to our race web site: www.BoxingDayRun.ca.